The arrival of Macho Macho, a swanky new eatery in a small, suburban shopping centre in West Ashgrove, is helping re-shape and modernise the popular precinct into a new go-to food destination. Macho Macho opened on 22 March 2018 in Waterworks Road, just in time for Easter. Locals and visitors will recognise the shopping area as situated diagonal to Ashgrove State School in the grey, art deco-inspired Montvue Building. So, I popped along to see what everyone has been talking about. When I first heard about Macho Macho cafe and bar, I wondered whether the name paid homage to a Village People song. 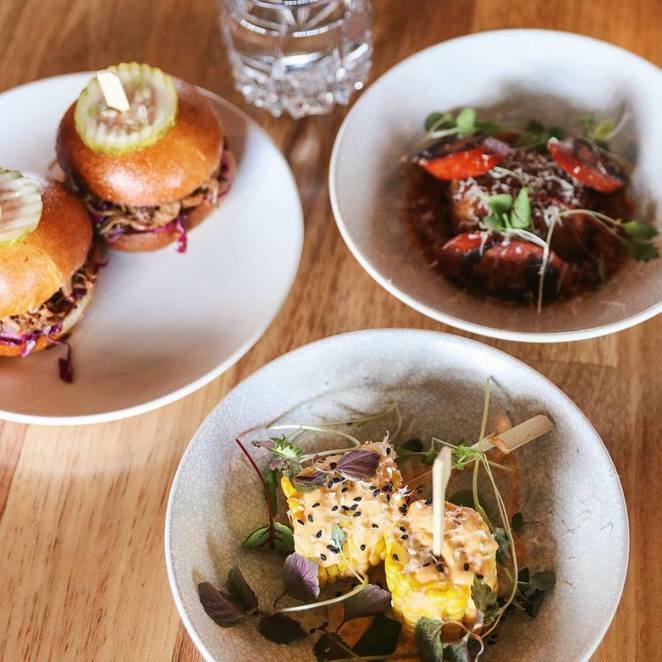 But it appears that Macho Macho is a play on the owner's surname, the Strong family, who also own Red Hill Brisbane cafes Arthurs Green and Artie and Mai. The fit-out of the cafe is modern and open with a palette of pinks, black and white. It was slightly smaller than what I imagined. 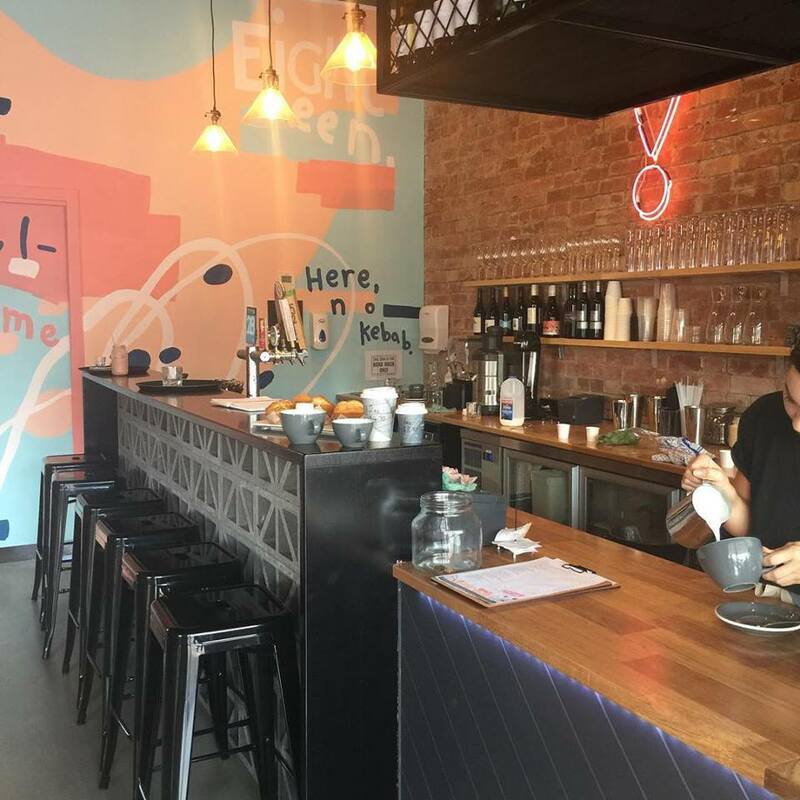 The inside has a raw, industrial look enhanced by a hand-painted mural by Joel Birch, alongside exposed brick walls and black painted breeze bricks forming the base of the bar. There is no outdoor dining area, but lots to enjoy inside. There is no doubt that the glowing, pink neon sign inside the shop stands out from the crowd and adds a softer side to the masculine sounding name. It certainly demands attention but is anything but, well, macho. Macho Machos' daytime menu features breakfast and lunch options ranging from $7.50 for toast, through to $25 for panko fish fillets. The honeycomb, ricotta and lavender hot cakes, a personal favourite ($19), were light, sweet and delicious. Vegetarian, gluten and vegan options and sides are also available. The night menu kicks in after 3pm with small and big sized offerings Those items worth a special mention are the crab, lemon and chilli linguine ($26), dukkah crusted eggplant $14 and crispy fish taco ($14) For something a bit fancy, there's the cassoulet duck leg confit $28. Macho Macho is open 7 days (including over Easter) and is licensed. So if you are passing through Ashgrove, it is worth checking out.